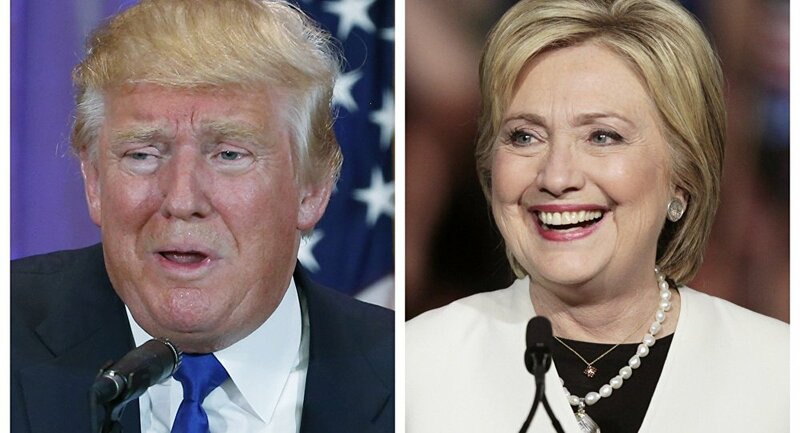 Former Secretary of State Hillary Clinton and billionaire businessman Donald Trump are running neck and neck as the two least liked US presidential candidates in the history of modern polling, a new survey revealed on Monday. WASHINGTON (Sputnik) — Some 54 percent of those surveyed dislike Clinton, compared to 34 percent of voters who have a positive opinion of the former top US diplomat, according to a poll by NBC News and the Wall Street Journal. Trump’s favorability rating is even lower — 58 percent of registered voters have a negative opinion of him, the survey found. "This has never been matched, or even close to being matched," Democratic pollster Peter Hart who conducted the survey said. When likely US voters were asked who they plan to vote for, results showed another tie, or at least a statistical dead heat, the poll added. "Clinton, who remains a heavy favorite to win the Democrat nomination, leads the presumptive GOP [Republican] nominee 46 percent to 43 percent among registered voters, a difference that is within the poll's margin of error of plus-or-minus 3.1 percentage points," a press release accompanying the poll said. In April, one month before the latest poll, Trump trailed Clinton by 11 percentage points. Meanwhile, Democratic Senator Bernie Sanders, who continues to battle for his party’s nomination despite Clinton’s seemingly insurmountable lead, would best Trump by a 54 percent to 39 percent margin in a hypothetical election held today, the poll revealed.